Planet Aid: Help to the Poor or a Charitable Pandora's Box? VERMONT — A national nonprofit group that recently began accepting used clothing and shoes at yellow drop boxes throughout Vermont has some people asking whether the group is siphoning donations away from other, well-established local charities, or actually benefiting the poor people it claims to help. 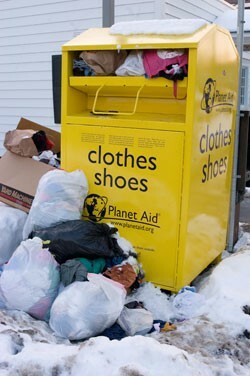 Planet Aid, Inc., launched about 10 years ago in the Boston area, accepts old clothes that would otherwise end up in landfills and sells them in developing countries. According to the group, the proceeds are then donated to various charities around the world, primarily those that fund schools, development projects and anti-AIDS projects in India, Africa, China and Latin America. Today, the organization has nearly 10,000 drop boxes nationwide, including 98 in Vermont, according to Jay Allen, operations manager for Planet Aid-New England. There’s one at the Mobil station across from Battery Park in Burlington and another at the Gulf on Shelburne Road. But others challenge the claim that “nobody else wants” the goods that Planet Aid accepts. Captain Mark Unruh is the administrator of the Salvation Army’s Adult Rehabilitation Center in Portland, Maine. The 60-bed unit helps men, primarily those with histories of substance abuse, reintegrate into society. For many years, the center has been funded by revenue from the Salvation Army’s retail clothing outlets throughout northern New England. Neither the Salvation Army in Burlington, nor Goodwill Industries, which opened a retail clothing store in Williston in October, has reported any decline in donations thus far as a result of Planet Aid’s recent arrival in northern Vermont. And Allen, who claims he worked for Goodwill for years, says his organization is not a competitor to those groups, since many of the donations they receive come from drop boxes at landfills and waste transfer stations, where they would otherwise be discarded. Further clouding the picture is the fact that Planet Aid hasn’t been scrutinized yet by other organizations that evaluate nationwide charities, such as Charity Navigator, the nation’s largest evaluator of philanthropic groups, or the Better Business Bureau’s Wise Giving Alliance. The Better Business Bureau website notes only that Planet Aid has submitted its financial documents for review and a report is expected shortly. Guidestar.org, which compiles the tax records of more than 1.7 million charitable groups worldwide, posts Planet Aid’s IRS filings for the last eight years. According to the group’s most recent 990 document, in 2006 Planet Aid gave nearly $5 million to development programs in countries such as Mozambique, Zimbabwe, Angola, China and Botswana. The documents also indicate that many of those projects are run by an organization called the International Humana People-to-People Movement, with which Planet Aid is affiliated. Therein lies the source of many of Planet Aid’s PR woes. Humana was founded in Denmark in 1977 by Mogens Amdi Pedersen, an enigmatic and controversial character who over the years has been accused of — and occasionally charged with — everything from tax fraud and embezzlement to running a secretive international cult. In February 2002, Pedersen was arrested by the FBI at Los Angeles International Airport. He was later extradited back to Denmark. In April 2002, the Boston Globe reported that Humana’s recycled clothing operations in France, which had links to Planet Aid’s Massachusetts operations, had been reclassified as commercial. In 1998, the British government took a recycled clothes business operated by Humana into receivership when it couldn’t determine how its money was being spent, the Globe also noted. Additionally, much of the other negative press about Planet Aid appears to have been generated by Humana Alert, whose website, tvindalert.com, chronicles the organization’s various business enterprises and legal and financial misfortunes. For his part, Allen at Planet Aid-New England insists that the claims made on that website are “absolutely false.” While he admits that Planet Aid supports Humana programs, he insists the group operates legally and completely above board.